Sign up for my daily emails, and you’ll never miss a thing! Or I have a weekly option as well. One piece I could never part with, the trusty jean jacket! Love your outfit and the sunshine!!! Supposedly, the sun and warmer days are coming to Michigan this week! Let it be! LET IT BE! Indeed. 🙂 It’s supposed to warm up here this week too. I can’t wait! This is a great outfit! Is this how you are dressing now? Are you totally wearing Spring clothes, colors, ,etc. just layering? Noooo…. 🙂 I wish!!! Although it is going to be 70 on Wednesday, so I may break out this outfit then! These are ideas for spring outfits, but not necessarily what I’m wearing. This is more of the type of thing I’ll be wearing in April, but others are in southern states where it’s warmer already, so Cyndi and I decided to do this series in March. I do post my daily outfits on Instagram, and in my Instagram Recaps here on the blog on Sundays, if you want to see what I’m REALLY wearing right now. 🙂 I have pretty much ditched the turtlenecks but I still wear jeans and long sleeves and even boots sometimes. So cute today! I have the same tee in Zenia and love the color. The white pants idea scares me a bit but I have some light grey crop jeans coming in my first trunk that may substitute. Grey would be beautiful with that tee too! I love this outfit. It’s how I like to dress. I saw it in the store window and went in to try it on. It’s very well made. Runs small (I would need to go up a size). You’re wearing one of my favorite tees ever, the Loft Vintage Tee. I can vouch for these tees. They’re lightweight, flattering, and Loft brings new colors every season. The Zinnia is so pretty. I also like the new Periwinkle. I love the white jeans. Hope you keep styling them! Awesome, thanks for the tip on the Forever 21 jacket. And yes, I LOVE the LOFT vintage tees. They wash and wear well and come in a great assortment of colors. Are you wearing a medium in this t-shirt? Yes! It’s a medium. I meant to add my sizes for reference. It is definitely your perogative to spend as much or as little as you want on your clothing. I’m not going to criticize you for that. What I used to love about your blog was how I could relate to you. Your outfits seemed so put together and polished but so wearable. I looked at you and said to myself, “I can do that.” But as your clothing prices go up, I am having a hard time relating to you. I appreciate that this post contains budget options, but I would appreciate it so much more if you were wearing some of the budget options. I’m sure you don’t mean to, but it comes across like the budget options are not good enough for you but they will do for the rest of us. You’re right, that is certainly not how I mean to sound. I have many people thanking me for the budget options, so I will continue to offer them although it adds quite a bit of extra work to each post. I’ve always appreciated higher quality clothing – especially shoes, bags, and jeans. As I’ve gotten older, I’ve seen how the better quality clothes fit and wear better, and I find the cheaper clothing getting cycled through my closet, while the quality pieces find a home year after year, so I prefer to feature those types of pieces because that is what I can whole heartedly recommend. Super cute outfit! I pretty much have everything similar in my closet except for the bag. It’s so cute and seems to go with a lot! that it takes. I applaud and appreciate you for what you’re doing. I wish as women we could celebrate each other’s success and not be blinded and consumed by jealousy! Keep doing what you’re doing—-you’re FABULOUS!!!! Thanks, Gina! I often forget about J.Crew. And TJ Maxx is a great place to pick up designer denim, as is Nordstrom Rack and some of the other off price stores. I was out yesterday trying on white jeans. None were the thicker jean material that I would like. Can you recommend a brand that is made of a good weight denim? Joanna, I was also frustrated and disappointed when I went looking a few weeks ago. Even premium brands seemed thinner than they should be. In fact, the cheaper brands are often thicker because the material isn’t as nice and it tends to be stiff – which is why I invest in the premium ones. They are so much more comfortable. But it makes them thinner, and the white can be see through. I don’t know what price point you’re looking for, but DL1961 is known for being thicker, and I can attest to their comfort and fit as well. I have the Florence in white (http://bit.ly/1U7Zw7j), and I love their Emma style. It’s more of a legging jean (http://bit.ly/21T90Jy). I had them in white, but returned b/c I don’t need another pair. But they are SO super soft and nice and thick. The ones I have featured in this post are J Brand, and they’re pretty good for not being see through. 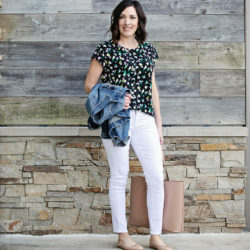 For less pricey brands, I’ve heard a lot of people recommend the LOFT white jeans. I hope that helps! Love the outfit! When you wear a jean jacket, should you be able to button it or does it still “fit” if it lays open? Thanks! I think technically you should be able to button/zip it, but I’m not sure i can zip this one. I could when I bought it, but it’s about 8 years old, lol. I prefer mine to JUST BARELY close if I had to button or zip, but if there’s much overlap, it can look too big when it’s left open. Make sense? I love your blog and outfits you out together. Even though I rarely copy anything exactly, and I tend to buy less expensive things. It gives me ideas of how to put things together. I find it so helpful! Thank you for putting yourself out there for us! I love this outfit! So, so cute! I LOVE this outfit! I just may have to get that tee in that EXACT color! It’s beautiful! Yes! I would. I’d love to get one, but I haven’t taken the time to look for one yet. You are just too adorable! This is such a perfect spring outfit too. I’m so excited, I finally ordered what I hope will be a much more versatile denim jacket over the weekend. I’ve had a dark wash one for years but it just feels too dressy for a lot of my outfits. I’m still hunting perfect white jeans though! Why are they so impossible?! Love this outfit! I always buy 2 pair of white jeans to use one as a backup it never fails I’m getting something on them that won wash out! Depending on where the stain is I turn them into shorts! I think white converse would be cute or the lace up pointy toe flatt would work. After reading all the replies on cost of the clothes you use in your blog, well I work it into my budget. I believe the quality of the clothing saves you money in the long run, not only that better made clothing fits better and more flattering. Not everything I have is pricey I have at least 2 pair of pricey jeans, a couple of tops and shoes, firm believer you get what you pay for, you need some key pieces. This outfit is so cute! It’s nice to see gold accessories. It seems like silver has been the trend for a long time. Considering all of my raised eye brow moments over my kids choices of jeans I’m not sure that they’ll let me get away with the distressed look, but we’ll see! loving this spring fashion series Jo-Lynne! Haha, for the longest time, my daughter didn’t want to wear the distressed stuff, so I figured I was allowed. Now she’s wearing it, and I feel like I’m dressing like my teenage daughter – a definite no-no. So… I may have to rethink my stance. 😉 I do love these white jeans, though. Hey, Jo-Lynne…I’m a few days behind on your blog; however, school has been canceled the rest of the week, due to illness not weather, so I’m trying to catch up! I. Love. Everything. about this outfit! I’ll do solid white jeans instead of ripped ones, but this is fabulous! Glad you have time to catch up, but YIKES! What kind of illness closes down a school?? I hope you stay well. Students and many staff members have been diagnosed with Flu B, strep throat, and to top it all off with a stomach virus! We were out last Friday and went back this past Monday and Tuesday. Our school district consists of 5 elementary schools, one middle school, and one high school. On Tuesday, there were over 700 students and staff absent. Thankfully, my sons ages 18 and 16 haven’t gotten. It has been horrible! However, it kind of played in our favor since we didn’t have an official spring break in our school calendar and the weather here in KY has been mid 70s all week! Yayyy! !